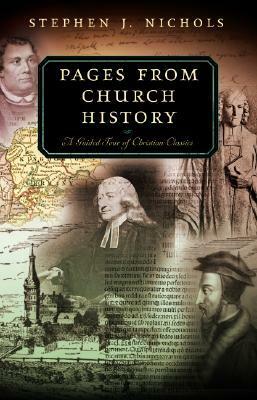 Nichols does an outstanding job at captivating the reader's attention with each figure of church history. He provides just enough basic information about each one, yet leaves the reader with a certain dissatisfaction, causing a desire to learn more about these men of God. I would highly recommend this book for a brief glance back through the ages of church history. Dr. Nichols is quickly becoming one of my favorite authors. His writing is clear and captivating. It has a depth and quality that reminds me of R. C. Sproul. The best cookies are the ones you can reach. Clear, readable, interesting, and informative. It makes church history a fun mix of biography and overview of important texts, without dumbing things down. Dr. Nichols was one of my professors at Lancaster Bible College. I've always loved his insight and scholarly wisdom. Learning church history is so important in our day and age. This is a great intro. Stephen J. Nichols - Stephen J. Nichols (PhD, Westminster Theological Seminary) is president of Reformation Bible College and chief academic officer of Ligonier Ministries. Previously, he served as research professor of Christianity and culture at Lancaster Bible College. He is an editor (with Justin Taylor) of the Theologians on the Christian Life series and is the author of several books, including The Reformation, For Us and for Our Salvation, The Church History ABCs, and Bonhoeffer on the Christian Life.